1Solomon was(A) building his own house thirteen years, and he finished his entire house. 2He built(B) the House of the Forest of Lebanon. 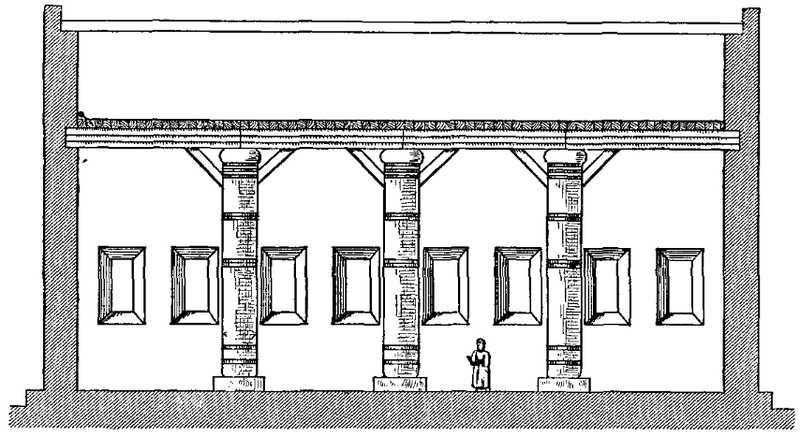 Its length was a hundred cubits[a] and its breadth fifty cubits and its height thirty cubits, and it was built on four[b] rows of cedar pillars, with cedar beams on the pillars. 3And it was covered with cedar above the chambers that were on the forty-five pillars, fifteen in each row. 4There were window frames in three rows, and window opposite window in three tiers. 5All the doorways and windows[c] had square frames, and window was opposite window in three tiers. 6And he made(C) the Hall of Pillars; its length was fifty cubits, and its breadth thirty cubits. There was a porch in front with pillars, and(D) a canopy in front of them. 8His own house where he was to dwell, in the other court back of the hall, was of like workmanship. Solomon also made a house like this hall for Pharaoh’s daughter(F) whom he had taken in marriage. 9All these were made of costly stones, cut according to measure, sawed with saws, back and front, even from the foundation to the coping, and from the outside to the great court. 10The foundation was of costly stones, huge stones, stones of eight and ten cubits. 11And above were costly stones, cut according to measurement, and cedar. 12(G) The great court had three courses of cut stone all around, and a course of cedar beams; so had the inner court of the house of the LORD and(H) the vestibule of the house. Yet, note that it was Solomon who was given the ultimate honour (2 Chronicles 4:18), though Hiram be the one who had the skill for making any work in bronze. 13And King Solomon sent and brought(I) Hiram from Tyre. 14He was the son of a widow of the tribe of Naphtali, and his father was a man of Tyre, a worker in bronze. And(J) he was full of wisdom, understanding, and skill for making any work in bronze. He came to King Solomon and did all his work. In particular, this Hiram who makes the temple furnishings is not the same Hiram spoken of in chapter 5. It is clear that this Hiram, unlike the king spoken of in chapter 5, is born of one Israelite parent, and not a simple Gentile – and like Bezalel son of Uri, the craftsmanship is a result of being full of wisdom, understand and skill (Exodus 31:1-11, 35:30-35 compare with v.14). Yet, with the precursor of chapters 3 and 4 where we are invited to the Solomon who is filled with extraordinary spiritual wisdom, it is undoubtedly the reason why Solomon receives the true and final glory as the builder of the temple. 15(K) He cast(L) two pillars of bronze. (M) Eighteen cubits was the height of one pillar, and a line of twelve cubits measured its circumference. It was hollow, and its thickness was four fingers. The second pillar was the same. [e] 16He also made two capitals of cast bronze to set on the tops of the pillars. The height of the one capital was five cubits, and(N) the height of the other capital was five cubits. 17There were lattices of checker work with wreaths of chain work for the capitals on the tops of the pillars, a lattice[f] for the one capital and a lattice for the other capital. 18Likewise he made pomegranates[g] in two rows around the one latticework to cover the capital that was on the top of the pillar, and he did the same with the other capital. 19Now the capitals that were on the tops of the pillars in the vestibule were of lily-work, four cubits. 20The capitals were on the two pillars and also above the rounded projection which was beside the latticework. There were(O) two hundred pomegranates in two rows all around, and so with the other capital. 21(P) He set up the pillars at the vestibule of the temple. He set up the pillar on the south and called its name Jachin, and he set up the pillar on the north and called its name Boaz. 22And on the tops of the pillars was lily-work. Thus the work of the pillars was finished. Indeed, such a message is amplified by the pomegranate rows and the lily-work at the top of each pillar; the former fruit also used on the robe of the priest (Exodus 28:33, 39:24-25) and described as a fruit desired in the wilderness (Numbers 13:23, 20:5); and the latter described as a blossoming flower in the midst of Israel’s redemption from Assyria, its restoration once again to days of glory (Hosea 14). 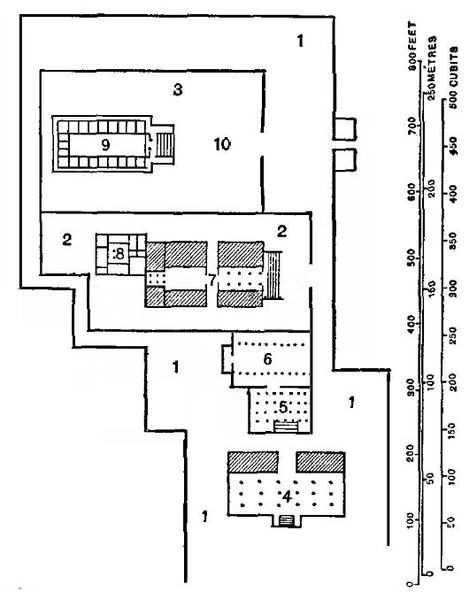 What is noticeable about the deuteronomist description of the Temple, as already mentioned, is that it is a strikingly historical rendition of the architectural blueprint. This explains why the chronicler would include the bronze altar for this is a crucial aspect of the Temple as made of an altar of worship made of “uncut” stone. 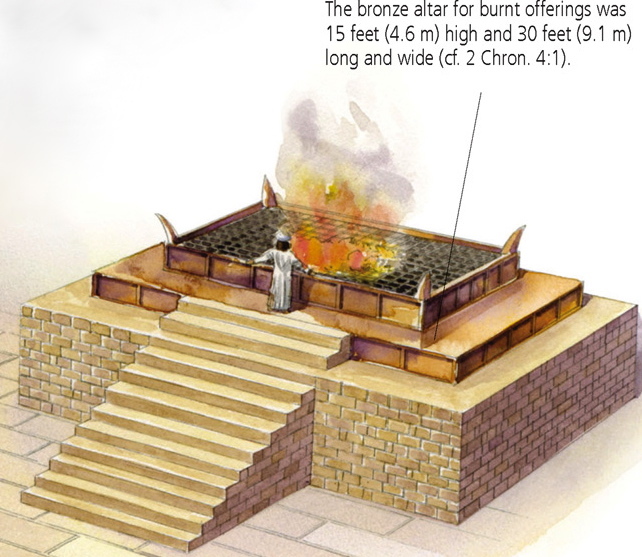 According to rabbinic tradition, it is absolutely significant that this bronze altar is included in the design of Solomon’s Temple, for this is the same place as where the Angel of the LORD stayed His hand and where David had built the altar at the threshing floor (2 Samuel 24:24-25), ending the prophetic account of David’s reign as king of Israel. 13Then the sixth angel blew his trumpet, and I heard a voice from(V) the four horns of the golden altar before God, 14saying to the sixth angel who had the trumpet, “Release(W) the four angels who are bound at(X) the great river Euphrates.” 15So the four angels, who had been prepared for the hour, the day, the month, and the year, were released(Y) to kill a third of mankind. 16The number of(Z) mounted troops was(AA) twice ten thousand times ten thousand;(AB) I heard their number. 17And this is how I saw the horses in my vision and those who rode them: they wore breastplates the color of fire and of sapphire[c] and of sulfur, and the heads of the horses were(AC) like lions’ heads, and fire and smoke and sulfur came out of their mouths. 18By these three plagues a third of mankind was killed, by the fire and smoke and sulfur coming out of their mouths. 19For the power of the horses is in their mouths and in their tails, for their tails are like serpents with heads, and by means of them they wound. 20The rest of mankind, who were not killed by these plagues,(AD) did not repent of(AE) the works of their hands nor give up worshiping(AF) demons(AG) and idols of gold and silver and bronze and stone and wood, which cannot see or hear or walk, 21nor did they repent of their murders or their(AH) sorceries or their sexual immorality or their thefts. 3You shall make pots for it to receive its ashes, and shovels and basins and(BB) forks and fire pans. You shall make all its utensils of bronze. Fire, ashes… these are marks of one of the few plagues in Revelation, and seems to speak a lot about punishment. Indeed, this is an altar of offering, and the similar punishment is re-enacted on the sacrificial offering; but it helps to understand the detail of such a sacrificial offering, how it comes around and how God puts into practice these judgments by His four angels – and that these sacrificial offerings, which don’t SAVE us, but point to the Christ who is the full meaning of the true Sacrificial Offering once and for all. How fitting it is that the Brazen Altar is in the Courtyard, rather than in the Tabernacle? Indeed, we can only enter the new creation Temple by the sacrifice of the Lamb in our world (symbolized by the Temple/Tabernacle court), redeeming all of creation, before we can be brought into the golden city of new Jerusalem. Akin to the basin of bronze in Exodus 30:18, 40:11, so also the basin of bronze here holds water for the priests to wash in and supported by twelve oxen in sets of three, facing north east south and west, akin to the face of the angelic living creatures in Ezekiel 1:10, such sent ones being the foundation of the cleansing water, held inside a basin formed like the blossoming lily at the top of Jachin/Boaz. 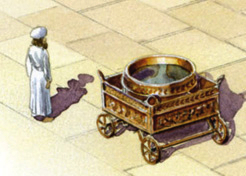 Just as the bronze altar was outside the tabernacle for propitiation before entrance into the Holy Place (similarly emulated in the Temple court), so also the bronze basin which was placed between the tent of meeting and the altar (Exodus 40:30) for the purpose of washing (c.f. Titus 3:5-7), is similarly placed in the Temple court. 27He also made the(U) ten stands of bronze. Each stand was four cubits long, four cubits wide, and three cubits high. 28This was the construction of the stands: they had panels, and the panels were set in the frames, 29and on the panels that were set in the frames were lions, oxen, and cherubim. On the frames, both above and below the lions and oxen, there were wreaths of beveled work. 30Moreover, each stand had four bronze wheels and axles of bronze, and at the four corners were supports for a basin. The supports were cast with wreaths at the side of each. 31Its opening was within a crown that projected upward one cubit. Its opening was round, as a pedestal is made, a cubit and a half deep. At its opening there were carvings, and its panels were square, not round. 32And the four wheels were underneath the panels. The axles of the wheels were of one piece with the stands, and the height of a wheel was a cubit and a half. 33The wheels were made like a chariot wheel; their axles, their rims, their spokes, and their hubs were all cast. 34There were four supports at the four corners of each stand. The supports were of one piece with the stands. 35And on the top of the stand there was a round band half a cubit high; and on the top of the stand its stays and its panels were of one piece with it. 36And on the surfaces of its stays and on its panels, he carved cherubim, lions, and palm trees, according to the space of each, with wreaths all around. 37After this manner he made(V) the ten stands. All of them were cast alike, of the same measure and the same form. 4 As I looked, behold, a stormy wind came out of the north, and a great cloud, with brightness around it, and fire flashing forth continually, and in the midst of the fire, as it were gleaming metal. 6 but each had four faces, and each of them had four wings. 7 Their legs were straight, and the soles of their feet were like the sole of a calf’s foot. And they sparkled like burnished bronze. 9 their wings touched one another. Each one of them went straight forward, without turning as they went. 10 As for the likeness of their faces, each had a human face. The four had the face of a lion on the right side, the four had the face of an ox on the left side, and the four had the face of an eagle. 11 Such were their faces. And their wings were spread out above. Each creature had two wings, each of which touched the wing of another, while two covered their bodies. 12 And each went straight forward. Wherever the spirit would go, they went, without turning as they went. 13 As for the likeness of the living creatures, their appearance was like burning coals of fire, like the appearance of torches moving to and fro among the living creatures. And the fire was bright, and out of the fire went forth lightning. 14 And the living creatures darted to and fro, like the appearance of a flash of lightning. 15 Now as I looked at the living creatures, I saw a wheel on the earth beside the living creatures, one for each of the four of them. 16 As for the appearance of the wheels and their construction: their appearance was like the gleaming of beryl. And the four had the same likeness, their appearance and construction being as it were a wheel within a wheel. 17 When they went, they went in any of their four directions without turning as they went. 18 And their rims were tall and awesome, and the rims of all four were full of eyes all around. 19 And when the living creatures went, the wheels went beside them; and when the living creatures rose from the earth, the wheels rose. 20 Wherever the spirit wanted to go, they went, and the wheels rose along with them, for the spirit of the living creatures was in the wheels. 21 When those went, these went; and when those stood, these stood; and when those rose from the earth, the wheels rose along with them, for the spirit of the living creatures was in the wheels. “It has been already pointed out that ten is one of the perfect numbers, and signifies the perfection of Divine order, commencing, as it does, an altogether new series of numbers. The first decade is the representative of the whole numeral system, and originates the system of calculation called “decimals,” because the whole system of numeration consists of so many tens, of which the first is a type of the whole. * When David numbered the people (2 Sam 24 and 1 Chron 21), this payment was not made and God’s claim was not met. Hence the judgment which followed. Note from Bullinger’s analysis that the number ten is indeed a number of divine order (in comparison to 12, which intimates divine government; or seven, which intimates new creation rest and Sabbath); as noted in its inclusion in the timing of the flood, the ordering of the ten nations, the silver sockets of the tabernacle as foundation, the redemption money, and finally the ten instances of the sons being preferred before the elder – all of these are instances of God’s sovereignty, order and His will in election through Christ. It is therefore no different that the cleansing utensils and the lamps bear the same number to indicate that such sovereignty, ordering and election is borne perfectly out of the washing and moving of the unpredictable and uncontrollable wind and Spirit (ruah) of the Father and the Son (the lamp and lampstands representing the Spirit explained in my tabernacle notes for Exodus 25:31-40). 38And he made(W) ten basins of bronze. Each basin held forty baths, each basin measured four cubits, and there was a basin for each of the ten stands. 39And he set the stands, five on the south side of the house, and five on the north side of the house. And he set the sea at the southeast corner of the house. II Chronicles 4:6: He also made ten basins in which to wash, and set five on the south side, and five on the north side. In these they were to rinse off what was used for the burnt offering, and the sea was for the priests to wash in. 40(X) Hiram also made(Y) the pots, the shovels, and the basins. So Hiram finished all the work that he did for King Solomon on the house of the LORD: 41the two pillars, the two bowls of the capitals that were on the tops of the pillars, and the two(Z) latticeworks to cover the two bowls of the capitals that were on the tops of the pillars; 42and the(AA) four hundred pomegranates for the two latticeworks, two rows of pomegranates for each latticework, to cover the two bowls of the capitals that were on the pillars; 43the ten stands, and the ten basins on the stands; 44and(AB) the one sea, and the twelve oxen underneath the sea. 45Now(AC) the pots, the shovels, and the basins, all these vessels in the house of the LORD, which Hiram made for King Solomon, were of burnished bronze. 46In the plain of the Jordan the king cast them, in the clay ground between(AD) Succoth and(AE) Zarethan. 47And Solomon left all the vessels unweighed, because there were so many of them;(AF) the weight of the bronze was not ascertained. Finally, we come to the end of Hiram’s contribution to the Temple – his contribution all made of burnished bronze – the picture amplified by Ezekiel, Daniel and John’s (Ezekiel 1:7; Daniel 10:6; Revelation 1:15-16) visions of the living creatures and the Christ, all of whom had a combination of arms, legs and/or bodies of burnished bronze – refined in a furnace; the Son of God, who has eyes like a flame of fire, and whose feet are like burnished bronze (Revelation 2:18, being a new addition to Daniel 10:6), having been refined through hell, the fiery furnace (Daniel 3; Matthew 13:42-50), and returning being purified in the Holy of Holies of the third heaven. Such is the beauty of burnished bronze, that is has stood the test of time, trial and endured the process to being purified – all symbolized by the work done by Hiram for the utensils primarily all outside of the Temple (c.f. the court of the priests, great court and doors for the court overlaid with bronze). Even the focus on the ten stands, basins, and the one sea – with the twelve oxen underneath the sea – all represent the judgment (represented by the sea – c.f. fish in the sea in Habakkuk 1:14, sea water again fresh water in Ezekiel 47:8-12 and the passing away of the sea in Revelation 21:1), which shall pass away and thus lead is into the golden holy city, new Jerusalem, coming down out of heaven from God, prepared as a bride adorned for her husband (Revelation 21:2) – naturally leading us to the description of the golden vessels. 48So Solomon made all the vessels that were in the house of the LORD:(AG) the golden altar,(AH) the golden table for(AI) the bread of the Presence, 49(AJ) the lampstands of pure gold, five on the south side and five on the north, before the inner sanctuary;(AK) the flowers, the lamps, and the tongs, of gold; 50the cups, snuffers, basins, dishes for incense, and(AL) fire pans, of pure gold; and the sockets of gold, for the doors of the innermost part of the house,(AM) the Most Holy Place, and for the doors of the nave of the temple. II Chronicles 4:7: And he made ten golden lampstands as prescribed, and set them in the temple, five on the south side and five on the north. II Chronicles 4:8: He also made ten tables and placed them in the temple, five on the south side and five on the north. And he made a hundred basins of gold. 51Thus all the work that King Solomon did on the house of the LORD was finished. And Solomon brought in(AN) the things that David his father had dedicated, the silver, the gold, and the vessels, and stored them in the treasuries of the house of the LORD. “It has been a question whether Solomon, in the structure of the temple, used any of the gold and silver which David had provided? And here it seems answered in the negative; for after the house was finished, with all its utensils and ornaments, with its immense profusion of gold, it is here said that Solomon brought in the silver, and the gold, and the vessels, which David his father had dedicated. It appears therefore that Solomon had employed four years to make preparation for the work before it was begun. During the whole time of the building, he was no doubt still appropriating a part of the public revenue for this purpose; and the provision made by his father he placed among the treasures of the house; but the temple was truly Solomon’s, as he had provided all its materials, and borne every expense. Yet, though none of the vessels, silver and gold were used, it is clear that David’s preparation and direction led to the successful fulfillment of the building of the Temple; just as Moses’ direction had led Joshua to victory in Jericho and Canaan despite Moses never stepping foot in the Promised Land. It is important that Solomon is the sole builder and David the prophet; so also Yeshua the sole victor and Moses the foreteller of the true leader to come (Deuteronomy 18:15) – explained ever more clearly in the coming chapters (and 2 Chronicles 5-8). I Chronicles 28:5: And of all my sons (for the LORD has given me many sons) he has chosen Solomon my son to sit on the throne of the kingdom of the LORD over Israel. I Chronicles 28:6: He said to me, ‘It is Solomon your son who shall build my house and my courts, for I have chosen him to be my son, and I will be his father. I Chronicles 28:8: Now therefore in the sight of all Israel, the assembly of the LORD, and in the hearing of our God, observe and seek out all the commandments of the LORD your God, that you may possess this good land and leave it for an inheritance to your children after you forever. Note how clearly we see the LORD identifying Solomon as the elected son of David, this peaceful man not only identified as the son of David but the son of God (1 Chronicles 28:6) – it is clear that Solomon is but another figurehead for the eternal kingdom of God. Solomon shall by no means have an eternal kingdom, but the LORD’s establishment of Solomon’s kingdom forever (v.7) is entirely fulfilled in Christ Jesus who brought true peace in eternity (Revelation 22:5). This temple is by no means an inanimate object of man’s sacrifice to God, but like the sacraments, it is very much an example of the gospel display to men, of God reaching out to men before we even knew Him. For David, building the temple is an intensely spiritual activity which we cannot fully fathom unless, like Solomon, we were to “know the God of our father and serve him with a whole heart and with a willing mind” (v.9 paraphrased). We should also importantly observe that Solomon did not plan to build this temple; this oath, preparation and dedication began with David, this second king of Israel who was the only man provided with explicit instructions on how to build this great temple (1 Chronicles 28:19). Solomon’s role was to fulfill what David had prepared, building the temple in Jerusalem on Mount Moriah, the symbolic place where Jesus appeared to David his father on the threshing floor of Ornan the Jebusite (1 Chronicles 21:15), and more importantly where the Lamb of God would be provided and slaughtered in a more real manner than Isaac had been in Genesis 22. Here we must see progressive revelation of Christ at play – where Saul and David are differentiated by their very reprobation and election respectively; the rejecting of Saul as the man of physical charm, as the man elected by other men, compared against David the man after God’s heart, the man of covenant love with Saul’s son Jonathan, the man whom God elected and no other. They are the two aspects of Israel which we see throughout the Old Testament, both born in periods of war and blood, just as Moses was the very representative of the law prior to his (non)-entrance to Canaan. Yet, Solomon and Joshua both play the role of fulfillment; where David the true king preaches and prepares for this temple which he hoped to build, this temple must be built only by Christ who prepares a house for us today (John 14:2-3). Saul, like the Pharisaic Israelites, are ousted out of the picture in favour of the Christian line of prophets, priests, and kings like David, Samuel, Elijah, Elisha, John the Baptist. Yet it is Joshua and Solomon who shall replace Moses and David respectively, as the new age of salvation (from Oshea, meaning deliverer, to Yehoshua – meaning Jehovah delivered) and peace (Shalomo – Solomon’s name meaning peaceful) are the true aims of what the Old Testament and the law have been pointing us towards – the fulfillment and enactment of the gospel in historic space. This is why we can easily proclaim as in 1 Chronicles 6:18 – “But will God indeed dwell with man on the earth? Behold, heaven and the highest heaven cannot contain you, how much less this house that I have built!” Note that in 1 Chronicles 6:21, God is listening from heaven His “dwelling place” – even Solomon recognizes that this temple bears typological meaning; a mere shadow compared to the true dwelling place greater than heaven and highest heaven. 1(A) In the four hundred and eightieth year after the people of Israel came out of the land of Egypt, in the fourth year of Solomon’s reign over Israel, in the month of Ziv, which is the second month,(B) he began to build the house of the LORD. 2(C) The house that King Solomon built for the LORD was sixty cubits[a] long, twenty cubits wide, and thirty cubits high. 3The vestibule in front of the nave of the house was twenty cubits long, equal to the width of the house, and ten cubits deep in front of the house. 4And(D) he made for the house windows with recessed frames. [b] 5(E) He also built a structure[c] against the wall of the house, running around the walls of the house, both the nave and(F) the inner sanctuary. And he made(G) side chambers all around. 6The lowest story[d] was five cubits broad, the middle one was six cubits broad, and the third was seven cubits broad. For around the outside of the house he made offsets on the wall in order that the supporting beams should not be inserted into the walls of the house. The building of the temple began in Solomon’s fourth year of reign, in the month of Ziv, the second month. It is interesting to note that it is the second month in the ecclesiastical year, with the first month starting with Nisan – making Ziv the 8th month of the civil year (with the 1st civil year being Tishrei) – and it is in the month of Ziv that we have the Second Passover of Nisan 14, a year after the Exodus, in Numbers 9:11. This “pesach sheini” is for anyone who was unable to bring the offering on its appointed time in the previous month, due to being unclean or otherwise. Further, on the Ziv 20, we learn that this is the day that the Israelites depart their encampment near Mount Sinai and continue their journey when the pillar of cloud rose from over the tabernacle, a resumption of their travel into the Holy Land. “The house that King Solomon built for the LORD was sixty cubits[a] long, twenty cubits wide, and thirty cubits high. 3The vestibule in front of the nave of the house was twenty cubits long, equal to the width of the house, and ten cubits deep in front of the house. It is here that we see the two pillars, Jachin (in the south) and Boaz (in the north) (1 Kings 7:21), both meaning the LORD shall establish and strength respectively. 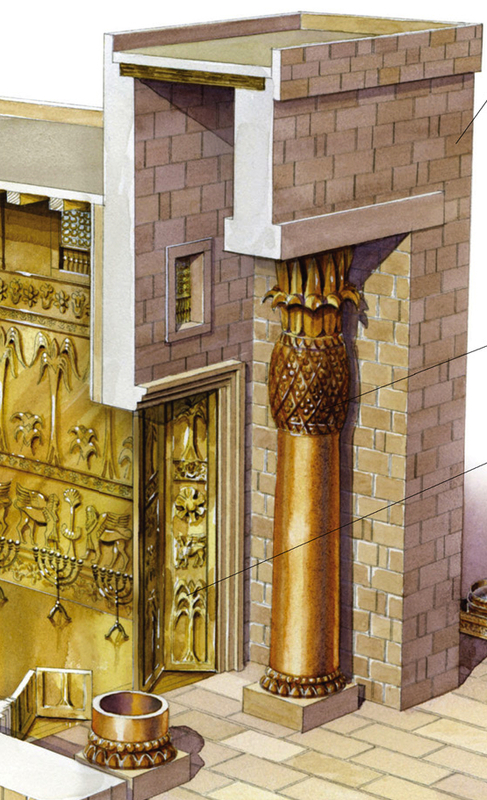 The entrance of the Temple is thus established, but note that these are hollow pillars (Jeremiah 52:21) – it is thus apparent that the true support of the entrance of the Temple does not come from these pillars; observe how they were not made until one chapter later. At this moment, we have only but the vestibule – and no pillars. We begin with the inside of the house windows with recessed frames; though there is indication that this may be related to the lampstands of pure gold (akin to the lampstand of the tabernacle), with the lamps arranged before the LORD regularly (Leviticus 24:4); or even that the lamps may burn throughout the evening (2 Chronicles 13:11); yet nothing is spoken of regarding the lampstand or the lamps at this stage. What we have is the first mention of windows with recessed frames, such windows located high on the side of the nave – and what are these but the windows of heaven from where the LORD provide such blessings (Malachi 3:10; 2 Kings 7:1-2), the blessing coming from the outside in, painting it with the gold of righteousness rather than the Babylonian vermilion (Jeremiah 22:14; Ezekiel 23:14-15). Immediately, instead of focusing on the glory within the temple, we are brought to see the blessings coming from the righteous King – He is the one who dwells in the heavens, and it is the windows of heaven that we receive the truth and the Father’s Word. The temple, however grand, is but a shadow, in comparison to the Word who descends from heaven (John 6:31-51). 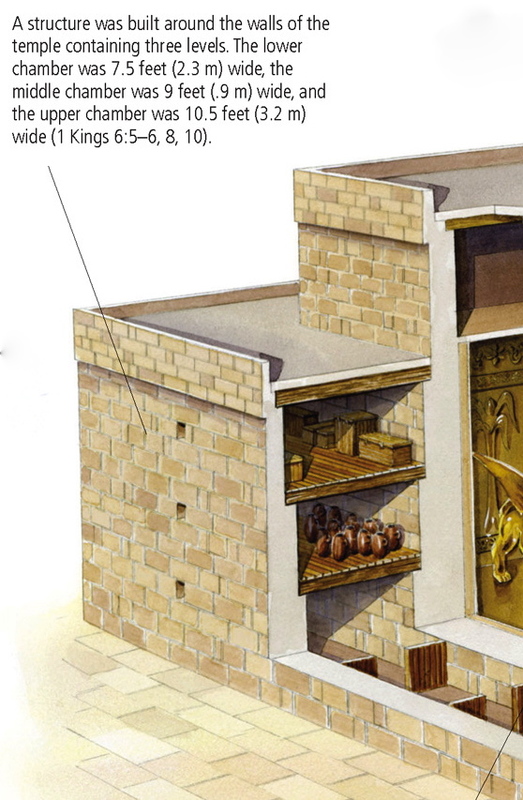 Genesis 6:16: Make a roof for the ark, and finish it to a cubit above, and set the door of the ark in its side. Make it with lower, second, and third decks. Ezekiel 42:1-9: Then he led me out into the outer court, toward the north, and he brought me to the chambers that were opposite the separate yard and opposite the building on the north. 2 The length of the building whose door faced north was a hundred cubits, and the breadth fifty cubits. 3 Facing the twenty cubits that belonged to the inner court, and facing the pavement that belonged to the outer court, was gallery against gallery in three stories. 4 And before the chambers was a passage inward, ten cubits wide and a hundred cubits long, and their doors were on the north. 5 Now the upper chambers were narrower, for the galleries took more away from them than from the lower and middle chambers of the building. 6 For they were in three stories, and they had no pillars like the pillars of the courts. Thus the upper chambers were set back from the ground more than the lower and the middle ones. 7 And there was a wall outside parallel to the chambers, toward the outer court, opposite the chambers, fifty cubits long. 8 For the chambers on the outer court were fifty cubits long, while those opposite the nave were a hundred cubits long. 9 Below these chambers was an entrance on the east side, as one enters them from the outer court. Why is it that there are three stories to the side chambers? Perhaps this question will soon be answered, but not before we are immediately brought back to the stone which was prepared at the quarry. 7When the house was built,(H) it was with stone prepared at the quarry, so that neither hammer nor axe nor any tool of iron was heard in the house while it was being built. Just as in Deuteronomy 27:5 and Joshua 8:31, the temple is built on stone which is not sculpted by hammer, axe, nor any tool of iron which could be heard in the house. This was prepared elsewhere in the quarry – and yet such a specific instruction was not provided except to Moses and to Joshua with regards to the building of an altar of worship, on which is offered burnt and peace offerings. Unlike any altar, this entire temple is built on the foundation of propitiatory worship, the Stone of God who was not struck (Exodus 12:46; Numbers 20:10-13) and the water is to flow from Him naturally without human intervention as He is the unblemished lamb, bearing only the Father’s wrath. 8The entrance for the lowest[e] story was on the south side of the house, and one went up by stairs to the middle story, and from the middle story to the third. 9(I) So he built the house and finished it, and he made the ceiling of the house of beams and planks of cedar. 10He built the structure against the whole house, five cubits high, and it was joined to the house with timbers of cedar. 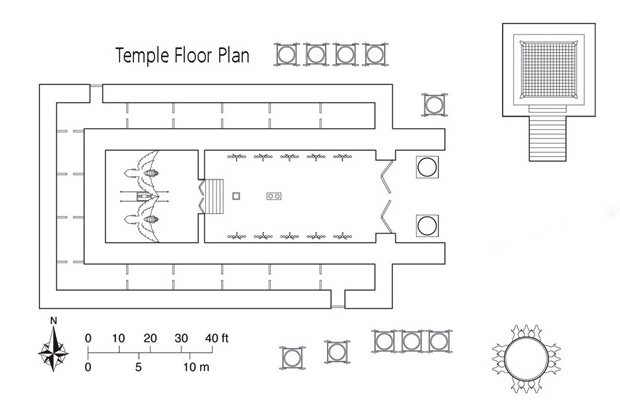 To sum up – the inside of the temple which emulates the holy place and the holy of holies of the tabernacle, respectively symbolizing the spiritual church of Christ and the third heaven where the Father sits, is coupled with the windows of heaven in the nave of the temple which brings in the light of Christ, the bread from heaven. And this is but covered on all three sides by the three stories of side rooms, which by ascension brings the priest to third heaven. Is this not true of the chambers which house the priestly work (Ezra 8:29; Nehemiah 10:37-39; Ezekiel 42:13, 46:19)? Are not these holy chambers where the priests shall eat the most holy offerings? And yet it is in this area of exclusive offering, just as the High Priest has exclusive access to the Holy of Holies as our sole mediator, that we see an actual re-enactment of such messengers, such angels, ascending and descending on the very sides of the temple – akin to the angels of God ascending and descending on the ladder (Genesis 28:12), the ladder who is the Son of Man (John 1:51), caught in the third heaven – the third story (2 Corinthians 12:2), just as the High Priest is caught in the Holy of Holies. Note also that there are entrances in both the south and the north of the temple akin to what is mentioned in Ezekiel 46:9 and as Matthew Henry notes: “Some observe that this may remind us, in the service of God, to be still pressing forward (Phil. iii. 13) and not to look back, and, in our attendance upon ordinances, not to go back as we came, but more holy, and heavenly, and spiritual.” Indeed, like Lot’s wife who had looked back on her previous ‘glory’ in Sodom and Gomorrah and her reward was to be transformed into a pillar of salt, so also we look forward to the new creation, to a renewed third heaven joining with earth, rather than our old glory from Eden to Canaan – but to look from Canaan to True Canaan. Solomon failed this command, for it relates exclusively to Christ who can walk in His statutes, rules and commandments – the establishment of His Word is but the Word of God, spoken to David (or more literally, the rising of the Word of the LORD with David – ְּדבִרי ־ ֶאת והִקֹמִתי u·eqmthi ath – dbr·i). Note the timing of the LORD speaking to Solomon concerning His word which came immediately after Solomon had finished building the basic structure of the temple. The command to walk in His statutes and obey his rules and keep all his commandments and walk in them is an echo of what David had commanded Solomon (no doubt, as directed by the LORD – 1 Chronicles 28:19), and solidifies the fact that this house of the LORD is made of the Stone of Life, such stone contributing to the building of a house and altar of worship. For it is in this propitiatory worship of burnt and peace offerings will we see the LORD dwelling among the children of Israel. All the instructions thereafter regarding the items of the temple shall therefore contribute to the baseline message of the temple being an altar of worship; the temple being a type of Christ Himself. He who is the Rock, the cornerstone; He who is the ladder in humiliation and ascension to third heaven; He who descends from this very third heaven as the bread of life – and it is for this reason that the temple shall be destroyed as a fulsome statement that Christ has always been this temple. That the temple pointed clearly towards the obedience of Christ, in bringing the church (in the nave) to the inner sanctuary as third heaven; in the ascending priest in the side chambers dedicated to holiness. 14(N) So Solomon built the house and finished it. 15He lined the walls of the house on the inside with boards of cedar. From the floor of the house to the walls of the ceiling, he covered them on the inside with wood,(O) and he covered the floor of the house with boards of cypress. 16(P) He built twenty cubits of the rear of the house with boards of cedar from the floor to the walls, and he built this within as an inner sanctuary, as(Q) the Most Holy Place. 17The house, that is, the nave in front of the inner sanctuary, was forty cubits long. 18The cedar within the house was carved in the form of(R) gourds and open flowers. All was cedar; no stone was seen. It appears from v.14-18 that the beams, planks and boards of cedar are not only used to cover the ceiling of the house, connecting the side rooms, but also used as the inside wall-lining (the outside being the stone prepared at the quarry), from the floor of the house to the walls of the ceiling (v.15), the floor being covered with cypress. Even the inner sanctuary, the Holy of Holies, was internally covered with boards of cedar – leading to a very wholesome coverage of the inside of the temple by cedar, carved in the form of gourds and open flowers (v.18 – such flowery decoration also made in Exodus 25:31-34, Numbers 8:4; and mentioned as elements of blossoming in Song of Solomon 2:12, though oftentimes used as a parable for the short life-span of men made of dust – Isaiah 40:6-8, 1 Peter 1:24), creating a huge elemental and symbolic contrast between the stony exterior and the cedar, and flowery interior, though reminding us that such beauty of the first temple is but a witness to the everlasting blossoming of New Jerusalem. To turn back to the wood, of all elements, why “cedar” and “cypress”? Oftentimes, cedar (especially cedar in Lebanon – 1 Kings 5:6, Lebanon as a country often referenced as a land of great fruit (Psalm 72:16), of great fragrance (Song of Solomon 4:11, Hosea 14:6), of great streams (Song of Solomon 4:15), of great beauty (Song of Solomon 5:15), of great wine (Hosea 14:7) – all signified by its name which means “white” as the white mountain range of Syria, such purity associated to the very temple of God) are referred to as strong wood (“the righteous…grow like a cedar in Lebanon” – Psalm 92:12), similar to cypress trees which also grow strong among the trees of the forest (Isaiah 44:14), and is compared in contrast to thorns (Isaiah 55:13), such beautiful wood representing the glory of Lebanon (Isaiah 60:13) described as beautifying the house of the LORD. The reddish and odiferous cedar is used in contrast to the acacia wood, the word representing the “thorn” – and in both instances we find the wood used for the tabernacle (Exodus 25-38) and the temple respectively similarly covered with gold. This symbolically pushes us in the direction of new creation glory in those who are protected by the aromatic, durable and insect repelling acacian, cedar and cypress wood, for it is in the red blood of the cross and the thorns of Christ’s crown that we see can stand firmly in the house of the LORD un-condemned, the true glory of such wood revealed by its new external surface of gold rather than such Christian symbols representing mere secular mediocrity. 19The inner sanctuary he prepared in the innermost part of the house, to set there the ark of the covenant of the LORD. 20The inner sanctuary[f] was twenty cubits long, twenty cubits wide, and twenty cubits high, and he overlaid it with pure gold. He also overlaid[g] an altar of cedar. 21And Solomon overlaid the inside of the house with pure gold, and he drew chains of gold across, in front of the inner sanctuary, and overlaid it with gold. 22And he overlaid the whole house with gold, until all the house was finished. (S) Also the whole altar that belonged to the inner sanctuary he overlaid with gold. Which brings us to the golden chariot throne – note the difference also between the Deuteronomist and the Chronicler in recounting the building of the temple – especially the omission of the golden chariot throne in the inner sanctuary which is mentioned in 1 Chronicles 29:18, screened by a veil of blue, purple and crimson, woven with fine linen and embroidered with cherubim (2 Chronicles 3:14), a combination of colours of royalty and judgment first mentioned in the instructions for the building of the tabernacle (Exodus 25:4; 26:1, 4, 31, 36; 27:16; 28:5-8, 15, 33-37). It is the Father who shall sit on this throne, fellowshipping with us. 23(T) In the inner sanctuary(U) he made two cherubim of olivewood, each ten cubits high. 24Five cubits was the length of one wing of the cherub, and five cubits the length of the other wing of the cherub; it was ten cubits from the tip of one wing to the tip of the other. 25The other cherub also measured ten cubits; both cherubim had the same measure and the same form. 26The height of one cherub was ten cubits, and so was that of the other cherub. 27He put the cherubim in the innermost part of the house. (V) And the wings of the cherubim were spread out so that a wing of one touched the one wall, and a wing of the other cherub touched the other wall; their other wings touched each other in the middle of the house. 28And he overlaid the cherubim with gold. 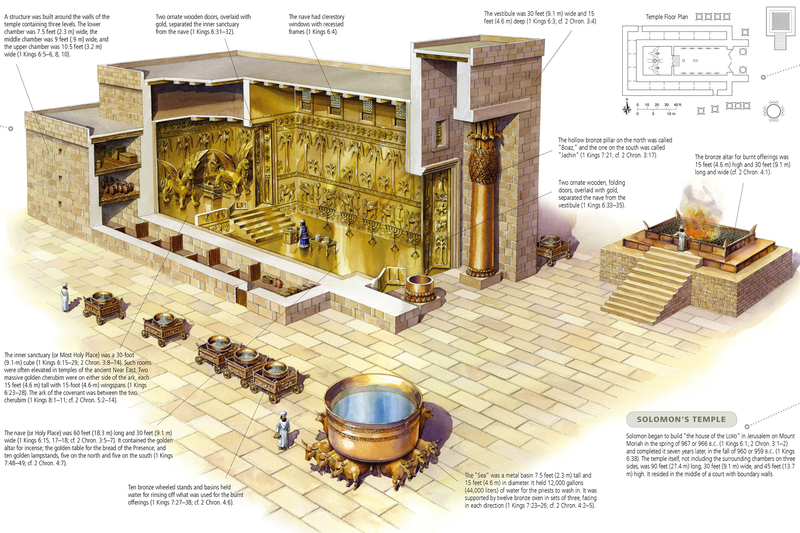 In this inner sanctuary we do not immediately move to the overlaying of gold; but instead, we are first brought to the witnessing of the joint cherubim covering the width of this temple’s Holy of Holies (v.24-25), being ten cubits high (v.23, 26) and ten cubits wide from the tip of one wing to the tip of another. This is reflective of the cherubim being the sent ones which carry the throne (Isaiah 37:16; Ezekiel 10:1-2), once again indicating that this temple, this altar of worship made of the Stone of Life, is reflective of the spiritual reality of third heaven which Moses had similarly received (Hebrews 8:5). In this inner sanctuary, the High Priest peers into what no man could peer except through the High Priest. To overlay the olivewood cherubim with gold (2 Chronicles 3:10) is, akin to the overlaying of gold in the entire inner sanctuary (v.20-22), matching the majesty of the third heaven which is unlike what we have perceived as righteousness on our side of creation (symbolized by the strong, colourful, odiferous cedar and cypress wood). What is further revealed by the Chronicler is that the house was adorned not only with the beautiful Stone, the work on which was not heard in the temple, inlaid with cedar and cypress wood and overlaid in the inner sanctuary by gold – but also that the house was set with precious stones (reminding us of the precious stones used in Exodus 28) and gold of Parvaim, which is the lining of the whole house, its beams, thresholds, walls and doors (v.30; 2 Chronicles 3:7). Unlike cedar and cypress, this olive wood which the cherubim are made of is often referred to as a life-giving plant, beautiful with good fruit (Psalms 52:8; Jeremiah 11:16). Furthermore, it has also been related in parallel two the temple lampstands (Revelation 11:4) by which light, representing the Holy Spirit (Exodus 25:31-40; Zechariah 4:1-6) tells us much about the reason why olive is used in relation to the cherubim. 29Around all the walls of the house he carved engraved figures of cherubim and palm trees and open flowers, in the inner and outer rooms. 30The floor of the house he overlaid with gold in the inner and outer rooms. Finally, note also that the cherubim do not only surround the throne, but also engraved around the walls of the house (2 Chronicles 3:7) alongside palm trees and open flowers. 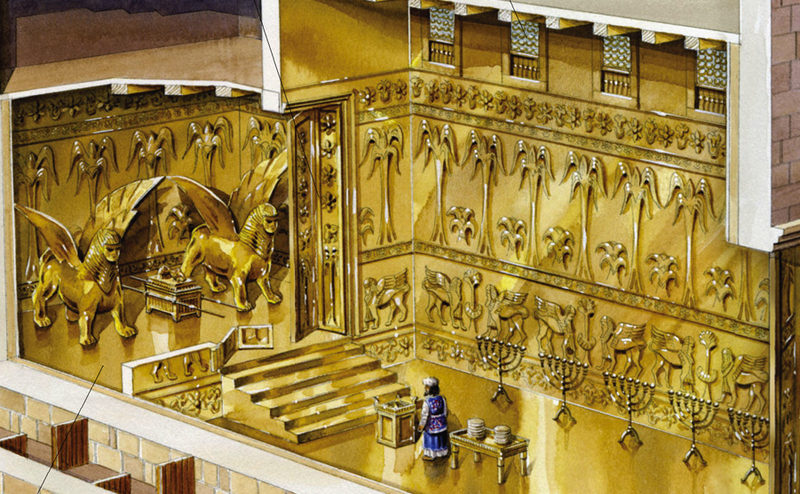 The golden cherubim, palm trees and open flowers etched into the wall and standing firm in over the throne and mercy seat of the Ark of Covenant in the Holy of Holies. This particular instruction concords with the artistic inclusion of the cherubim in the curtains of the tabernacle (Exodus 26, 36, 37, 37:9 especially which points to the cherubim overshadowing the mercy seat with their wings, the combination of cherubim around the Father’s throne, and the guardian cherub guarding the way to the tree of life in Genesis 3:24). It would seem, however, that the new inclusions would be the gourds, palm trees and open flowers. Such palm trees, like cedar, are referred to as a flourishing tree by which the righteous are compared (Exodus 15:27; Psalm 92:12), furthermore that such palm trees even becoming the identifying factor of a landmark city like Jericho (2 Chronicles 28:15). Jericho is known as a city of fragrance, fenced in the midst of a vast grove of palm trees in the plain of Jordan over the place where the river was crossed by Israel in Joshua 3:16, one of the most important cities to devote to destruction / holiness to the LORD prior to Israel’s inhabitation of the remainder of Canaan. If such palm trees signify such peace and rest (akin to the narrative in Exodus 15:27) and victory over Canaan, then it makes sense for its usage in John 12:13, representing Hosanna, the very eternal salvation fulfilled in Christ and only typologically fulfilled in the conquering of Canaan through Jericho. 31For the entrance to the inner sanctuary he made doors of olivewood; the lintel and the doorposts were five-sided. [h] 32He covered the two doors of olivewood with carvings of cherubim, palm trees, and open flowers. He overlaid them with gold and spread gold on the cherubim and on the palm trees. 33So also he made for the entrance to the nave doorposts of olivewood, in the form of a square, 34and two doors of cypress wood. (W) The two leaves of the one door were folding, and the two leaves of the other door were folding. 35On them he carved cherubim and palm trees and open flowers, and he overlaid them with gold evenly applied on the carved work. Once again, the symbolic olivewood, the same wood used to make the cherubim in the inner sanctuary, is the material used for the inner sanctuary – and the lintel and the doorposts were five-sided, enabling a folding effect on these two doors. To carry on the theme of the temple, carvings of cherubim, palm trees and open flowers are used as well, unsurprisingly overlaid with gold. The same material is also used for the entrance to the nave doorposts, though the doors themselves are made of cypress wood. Such beautiful wood opening us into the nave of the temple, into the very church of Christ; and it is by the five-sided double doors of olivewood that we are brought into the Holy of Holies, the inner sanctuary. There seems to be a stark difference in the entrance here compared to the entrance to the tabernacle, both facing the east. Where the tent of entrance into the tabernacle had no cherubim etched into the veil (Exodus 26:36), representing the cherub only standing between us and the tree of life in Genesis 3:24 (also at the east entrance of the garden), representing the veil between the Holy of Holies and Holy Place (Exodus 26:31-35) – yet it would appear that the gold is both on the inside and outside of the temple here (unlike any other part of the temple). Only by this entrance are we invited to see the inside of what the temple is like, when the entrance outside could have remained purely olivewood. Aside from the repeated use of such symbolic elements, note also how the two leaves of either doors into the nave were folding, reminiscent of the healing leaves of the nations as the very entrance of the door to the temple (Ezekiel 47:1-12; Revelation 22:2). 36(X) He built the inner court with three courses of cut stone and one course of cedar beams. Note finally the inner court which was built with cut stone and barely with cedar beams; such a large contrast outside the temple compared with the inside which is overlaid evenly with the golden glory of new creation, glorifying and refining (Malachi 3:2-3) the wood of olive, cedar, and cypress, shaped into open flowers, gourds, palm trees and cherubim. Such stone is indicatively cut here in comparison to the stone prepared in the quarry, and the uncut stone of the altar of worship in (Deuteronomy 27:5) – defining those who, though standing in the inner court of the temple’s presence, is still standing outside the church of Christ though receiving the heavenly sacrament of His Word in the combination of the symbolic cedar beams and equally symbolic cut stone, representing the work to being made in this creation but compared against the stone on which no work in the vicinity of the temple has been done, representing the work completed in new creation. 37(Y) In the fourth year the foundation of the house of the LORD was laid, in the month of Ziv. 38And in the eleventh year, in the month of Bul, which is the eighth month, the house was finished in all its parts, and according to all its specifications. He was seven years in building it. “The great work which Solomon was raised up to do was the building of the temple; his wealth and wisdom were given him to qualify him for that. In this, especially, he was to be a type of Christ, for “he shall build the temple of the Lord,”” Zech. vi. 12 (Matthew Henry). Indeed, this is how the chapter begins. Observe here that the subject of this chapter, after the wondrous insight into Solomon’s newly received Wisdom especially laid out by the end of chapter 4, is the very masterpiece and privilege which only this king could have. David who had retrieved the neglected ark (2 Samuel 6) had shared with Hiram in the past the concern of building a house for the name of the LORD (v.3 – “You know that David…”). Though the narrative in 2 Samuel does not record this in length (2 Samuel 7), this is recorded in 2 Chronicles 28 – and we see that the primary reason is because of the warfare with which his enemies surrounded him (v.3) as Solomon explains in this chapter. This implies that only one king in Israel has been suited to fulfil this role. Even to David’s dying day, he still had trouble securing peace and safety for Israel, whether externally or internally. Yet, in all the days of Solomon (1 Kings 4), rest is given on every side (v.4). It is therefore imperative that rest precedes the building of the house of the LORD; but the tabernacle was built in the wilderness. 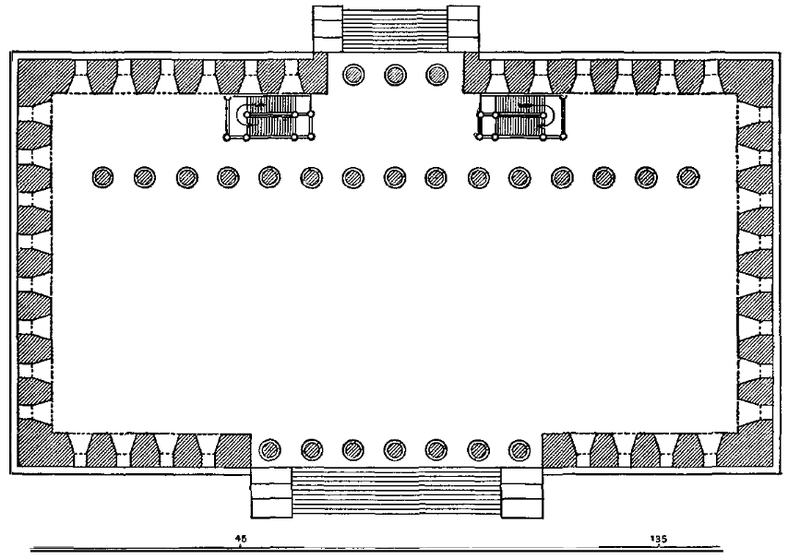 The contrast is important in understanding the purpose behind the two – for the tabernacle is but a representative of the moving presence of the LORD (Exodus 33), the very heart of the tribes surrounding it when it travels (Numbers 14:14; Nehemiah 9); yet, the First Temple is deliberately more concrete with a strong foundation for it represents the New Creation temple (Ezekiel 40-48; Revelation 21) after the wilderness of the end days, after the wilderness of Israel and the church, when we have finally, safely, and peacefully rested in true Canaan. V.5 is therefore a prophecy which relates exclusively to Solomon, the shadow of Christ. No one else can build this house but Christ; no hand riddled (and still riddling) with war can touch the temple which represents the eternal Sabbath rest of the Trinity and the church. What is particularly interesting is Zechariah’s Christological view of the building such a temple (Zechariah 6:12-15) in contrast with the historical narrative here regarding the building of the first temple – here, Solomon immediately appeals to Hiram, knowing that he as an influential non-Israelite king is capable of commanding the aid of skillful Sidonians using the beautiful cedars of Lebanon. The key importance of the cooperation of Hiram and Solomon, initiated by the latter, is that the Christ is the one who initiates the unity of the Israelites and the Gentiles in these very words “And my servants will join your servants” (v.6), such a powerful command in building this house of worship, mediation, sacrifice, propitiation, atonement. 7As soon as Hiram heard the words of Solomon, he rejoiced greatly and said, “Blessed be the LORD this day, who has given to David a wise son to be over this great people.” 8And Hiram sent to Solomon, saying, “I have heard the message that you have sent to me. I am ready to do all you desire in the matter of cedar and cypress timber. 9My servants shall bring it down to the sea from Lebanon, and I will make it into rafts to go by sea to the place you direct. And I will have them broken up there, and you shall receive it. And you shall meet my wishes(G) by providing food for my household.” 10So Hiram supplied Solomon with all the timber of cedar and cypress that he desired, 11while Solomon gave Hiram 20,000 cors[b] of wheat as food for his household, and 20,000[c] cors of beaten oil. Solomon gave this to Hiram year by year. 12And the LORD gave Solomon wisdom,(H) as he promised him. And there was peace between Hiram and Solomon, and the two of them made a treaty. Once again, we see the repeated phrase: “the LORD gave Solomon wisdom” (v.12 – 1 Kings 4:29), as if to emphasise that this treaty is not one made out of idolatry or sin. Rather, this treaty is of such alliance in building the central driving force of the identity of Israel as a priesthood-nation (Exodus 19:6), but built by the hands of non-Israelites. Note the exchange in v.6 – the building of the house of the LORD for the payment of wages for the servants, as set by Hiram (v.6). Yet, all that Hiram has asked for is a simple request to provide food for his household. Such a seemingly humble request is however blessed in return with such abundance which overwhelms mere food provision – 20,000 cors of wheat and beaten oil year by year is but reflective of God’s provision (Matthew 7:10) to our requests. 13King Solomon drafted(I) forced labor out of all Israel, and the draft numbered 30,000 men. 14And he sent them to Lebanon, 10,000 a month in shifts. They would be a month in Lebanon and two months at home. (J) Adoniram was in charge of the draft. 15Solomon also(K) had 70,000 burden-bearers and 80,000 stonecutters in the hill country, 16besides Solomon’s 3,300(L) chief officers who were over the work,(M) who had charge of the people who carried on the work. 17At the king’s command(N) they quarried out great, costly stones in order to lay the foundation of the house with dressed stones. 18So Solomon’s builders and Hiram’s builders and(O) the men of Gebal did the cutting and prepared the timber and the stone to build the house. Note how the “forced” labour is treated – such labour, though “forced”, has two months of rest at home (c.f. Leviticus 23:22; 25:4; Deuteronomy 24:19) akin to the rest provided to all in the year of Jubilee (Leviticus 25) – that Solomon should not wish for his men to spend more time outside of Israel than time spent with family or at home; it is apparent that though Solomon’s reign through Adoniram was tough on the Israelites (1 Kings 12:4), Rehoboam’s leadership and harshness led to Adoniram’s death (1 Kings 12:18). Such is the contrast of the labour, though forced, but by the leadership of The Man – for are we not slaves of Christ (1 Corinthians 7:21-22)? By this action, Solomon has redefined the meaning of “forced” – for under the rule of such a king, even our slavery to righteousness and to Christ redeems our very concept of “slavery” for the idea of forced labour and slavery has been marred by the leader him/herself, rather than the tool of such subservience. V.15-17 adds 153,300 people to the 30,000, totaling to a massive 183,300 people working on the momentous First Temple of Israel (c.f. the mobilization of the people to contribute to the tabernacle in Exodus 35-40). Never had there been such manpower and such exquisite skill spent on building the beautiful central hub of worship, and such a far cry from the sacrifices made on high places in 1 Kings 3, when all Christians whether Israelite or not are united to assist the King in building the house of the Lord of heaven and earth. Such a driven hierarchy, starting from Solomon’s command (v.17) to the chief officers (v.16); from Adoniram to the forced labour; from Hiram, to the Sidonians – we are witnessing in this chapter the most historic moment of God’s glory through man in the Old Testament. What stone can underlie this historic temple but “costly stone” (v.17) just as the tabernacle was laid with gold (Exodus 35-40)? Yet no stone can compare to Christ, the cornerstone and foundation (Psalm 118:22; Zechariah 10:4). “The old house finally runs out of odd stones, and collapses, being cast into the eternal rubbish heap…the new house is incredible, and is sealed with fire – the black stones turn into diamond, wonderfully reflecting the light of the White stone, the Cornerstone, constantly flowing (modern architecture is barely catching up to this), brilliant, and full of life.